Chicken is a healthy protein choice, especially if you remove the skin before cooking or eating it. 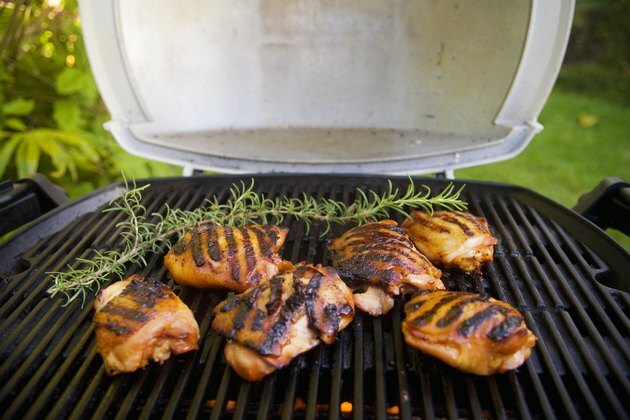 Both grilling and baking can produce juicy, flavorful, healthy chicken, but grilling leads to more carcinogen production during cooking, making it a less healthy choice. The same smoky flavor and char that gives grilled chicken its flavor is also harmful. However, eaten in moderation and with cooking methods to reduce the amount of carcinogens produced, you can still enjoy grilled chicken. All high heat cooking methods, including grilling, produce heterocyclic amines and polycyclic aromatic hydrocarbons, and exposure to high levels of these two chemicals may cause cancer. The production of HCAs and PAHs depends on the type of meat, the cooking time, temperature and method. Cooking methods, like grilling, that expose meat directly to smoking or charring, produce more PAH than other cooking methods. However, HCA production occurs whenever meats are cooked at temperatures over 300 degrees Fahrenheit, or when they are cooked for long periods of time, such as in the case of well done grilled meat, or oven roasting. To reduce HCA production during baking, put your chicken on a rack, as direct contact with a hot metal surface can increase HCA production. You can also lower the baking temperature to below 300 degrees F, as exposure to high cooking temperatures produce HCAs. When grilling chicken, HCA production is inevitable because of the high heat, but you can reduce PAH formation by partially cooking the chicken in a microwave before grilling, as shorter cooking times means less HCA and PAH formation. Refrain from basting your chicken as you grill it as the more fat that drips down, the more smoke there is, raising PAH formation levels. Cutting off charred bits of chicken after grilling also reduces exposure to PAH. For both baking and grilling, continually turn the meat to reduce HCA formation. While scientific research has found that exposure to high levels of both HCA and PAH is dangerous for animals, causing higher rates of cancer, there is no evidence that these consequences translate to humans. As well, the exposure levels on animals in these studies was significantly higher than people would experience in a regular diet. However, HCA and PAH exposure may increase the risk of cancer, even if there is no evidence that it will cause cancer. A human study published in 2007 in Cancer Epidemiological Biomarkers and Prevention found that HCA exposure increased the risk of pancreatic cancer in men and women by almost 30 percent. A 2005 issue of Cancer Research included a human study that found that consumption of well done meat, high in PAH, was linked with an increased risk of developing prostate cancer. Both grilling and baking are low-fat cooking methods, especially if you remove the skin from the chicken, either before cooking or before eating. Both cooking methods also need limited amounts of added fat. To increase the flavor and moisture of your chicken, marinate it first, as the flavors will be absorbed by the meat, depending less on char and smoke for flavor. Marinating means you need less flavor from added sauces, such as barbecue sauce, which can be high in calories. With marinated chicken, you can avoid high-sodium breaded baked chicken which can also raise the calorie content.